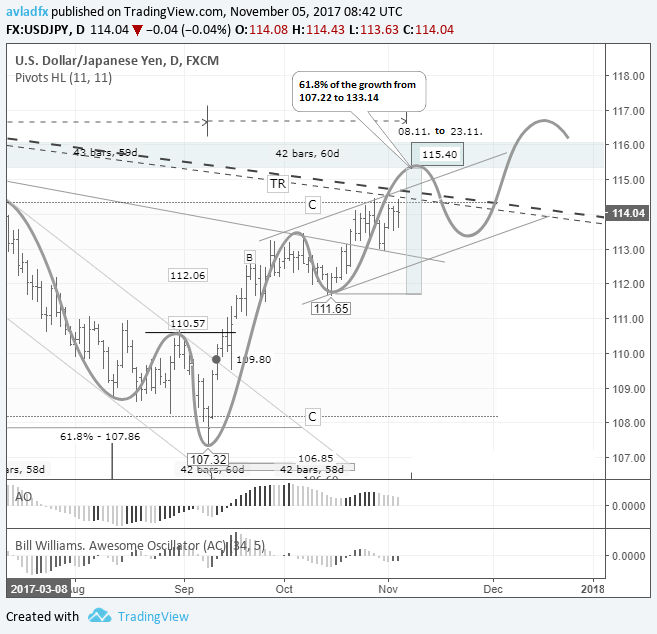 The last idea on the USDJPY pair came out on the 11th of September, 2017. At the time of publication, the dollar was trading at 107.84 JPY. On the 8th of September, before the weekend, the dollar dropped below the C-C channel and the 61.8% Fibonacci level of the upwards movement from 101.19 to 118.66. Given that the channel had been broken though, I was expecting the dollar to drop further. On Monday the 11thof September, the dollar closed up against the yen at 109.39 (+155 pips). The breakout of the channel turned out to be false. By the end of the day, the situation had reversed. On Friday the 3rd of November, the CFTC released a new weekly COT report, showing a summary of open positions by traders from 24/10/17 to 31/10/17 inclusive. Large speculators (Non-commercial): Last week, this group reduced both their short and long positions (long ones by more). Long positions fell by 4,042 to 50,784 contracts, while short positions fell by 2,645 to 171,209 contracts. Net short positions increased by 1,397 to reach 120,425 contracts. Small speculators (Non-reportable positions): This group also reduced their positions on the yen. Long positions fell by 948 to 18,572 contracts, while short positions fell by 1,515 to 47,935 contracts. Net short positions fell by 567 to 29,363 contracts. Hedgers (Commercial): This group is opening positions against large speculators. Last week, they increased their long positions by 1,597 to 215,981 contracts, short positions by 766 to 66,193 contracts. Open interest fell by 3,932 to 320,229 contracts. After the elections in Japan, the yen exited the B-B channel upwards and has been trading around the upper boundary of the C-C channel for the last two weeks. It’s been trading within the C-C channel for the last 196 days. The channel’s price range is around 600 pips. Last week, the US dollar gained 0.28% against the yen to reach 114.04. The yen’s drop was the result of a strengthening of the dollar across the board as a US labour market report was published. The trend line from the 125.86 top runs through 114.60, which reinforces the sideways channel. 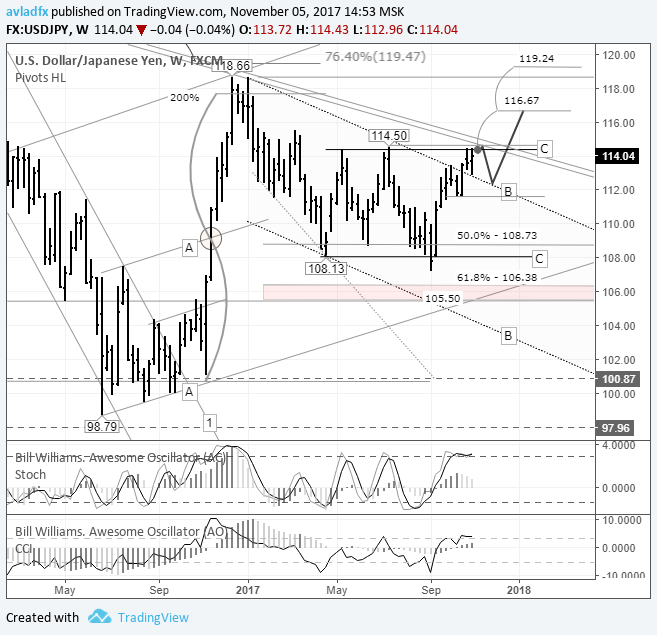 Considering that both large and small speculators are keeping their positions open against the yen, and that the Bank of Japan’s current monetary policy is weakening their currency, my forecast expects the yen to drop to 116.67. I don’t think that buyers will be able to break through the resistance zone (114.60 – 115.00) on the first attempt, and that there will be a rebound to around 112.45 – 113.35. After a correction to around this area, there’s an increased likelihood of reaching 119.24 levels. I’ve shown the sinusoidal movement I expect to see on the daily chart below. Cyclical analysis shows the dollar’s rise ending somewhere between the 8th and 23rd of November. I’ve highlighted a reversal zone on the chart above between 115.40 and 116.07 levels. 115.40 is the 61.8% Fibonacci level of the upwards movement from 107.32 to 113.44. If buyers manage to push the dollar up to 115.40, this will confirm the breakout of the trend line (114.80) on the daily timeframe, although it could turn out to be false on the weekly timeframe. I think that the dollar will remain bullish until the end of the year. The immediate target is 116.60.